Calapooia Street on the west side of the Albany Post Office block, Thursday afternoon. 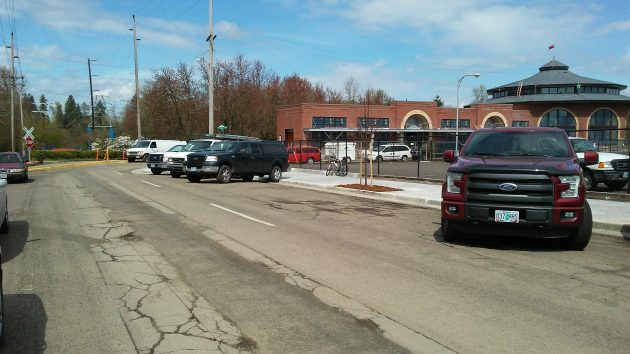 So how’s Albany’s new back-in angled parking working out? 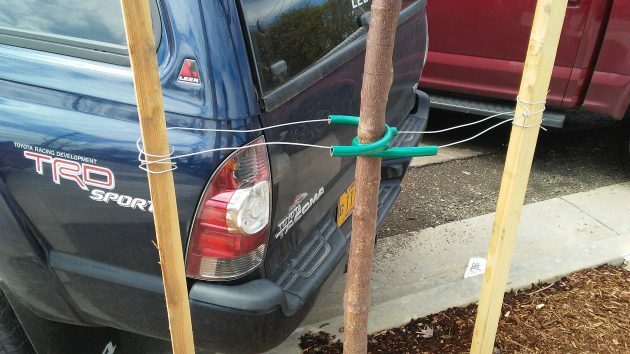 OK, I guess, but I’m getting a little worried about the new trees the city just paid to have planted. Diagonal back-in parking on two blocks was part of the design for redoing the streets and sidewalks around the post office. A contractor completed the job this winter. It is the first phase of a larger downtown streetscape improvement program (without angled parking, back-in or otherwise). On Calapooia Street on the post office’s west side, motorists have adopted the new pattern even though parking spots have not yet been painted on the pavement. Back-in angled parking has started on this block of Calapooia. It’s also provided for in front of the post office on Second. In the background, the Albany Carousel building. Riding past there on my bike on the way somewhere else, I happened to notice this. I also noticed that in a couple of cases, the rear ends of vehicles came pretty close to the new trees. A matter of inches, I would say. I’m wondering whether the designers of the tree placement were quite aware of one aspect of back-in parking: Vehicles end up hanging over the sidewalk, especially when we’re talking vans and pickups. Not much room to spare between rear bumper and new tree. Don’t agree with the backend parking and I am so upset about all the trees that have been cut down. I don’t agree with all the money they’re going to spend to change the walkways. The city needs to correct all of the roads in this town it’s ridiculous to go down 12th St. and jolt your way all the way down it. It’s ridiculous to spend millions on the streets that are perfect and not correct the ones that are bad. The people that have a problem with back in parking are the same as those that have a problem with parallel parking. You’re not supposed to drive by Braille, you don’t have to go until you hit your tire on the curb. I have not bought into the argument that backing into a diagonal parking space is something bad since if one pulled into a diagonal space head first, the only way out is to back out. Go try it in Corvallis, park with a large/long vehicle to your left and you will see how difficult it is to have clear vision when backing out. The insane thing to do is plant trees or put objects like trash cans or benches to back into. Maybe the Carousel or City budget should include valet parking for those who can’t back up. Lori Schumacher, the city engineer who helped develop the streetscape project, explained on Facebook: The tree locations were designed to be in line with the parking stripes so that no tree is directly behind a parking space. 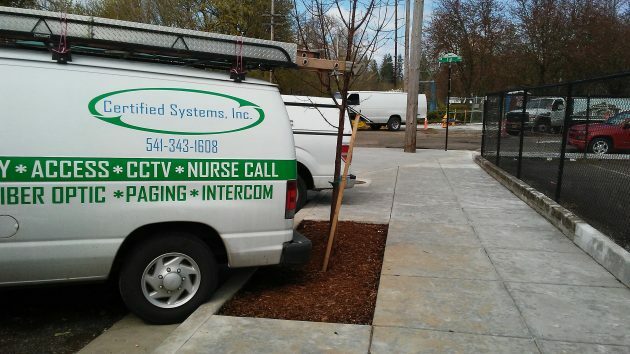 The striping has not been installed yet, so vehicles are not parking exactly where they should be and some are coming into conflict with the new trees. The city is just thinking ahead – in another 20 years all the cars will be self-driving and the problem will be solved.